David Sheff (Steve Carell) dabbled in his share of drugs as a youth but seemingly grew out of that phase and developed into a responsible adult. On the other hand, his son, Nic (Timothee Chalamet), didn’t have the same luck in his experimental drug phase. Although experimenting with numerous drugs, Nic specifically became addicted to crystal meth, a highly addictive and dangerous drug that is nearly impossible to quit. 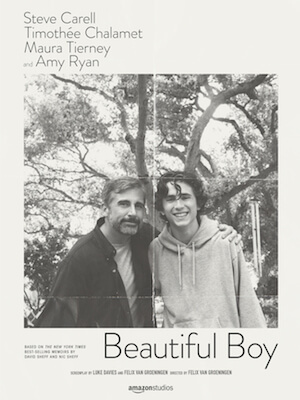 Directed by Felix Van Groeningen, Beautiful Boy is based on the true story of Nic Sheff’s addiction, David’s heart-wrenching struggle to save his son, and the family dynamic surrounding this difficult situation. When Nic wasn’t home, David seemed to live a picture perfect life with his newer family; his second wife, Karen (Maura Tierney), and their two children. They seemed happy and lived in a generous and well-kept home. David cooked and Karen made art. But when Nic was around, everything seemed heavy. David began to devote his life to helping his son, not only by being there for him and taking him to rehab, but by researching the drug and what was actually going on inside of Nic’s body. This was clearly a large time commitment and was very emotionally draining, not only on David but on his family as well. Throughout the film, we see numerous flashbacks to when Nic was a young boy. Not only does this highlight the special relationship between Nic and David, but it humanizes him as an addict. All too often, I think that addicts are portrayed as less than others or looked down upon. Some people have no pity for them because they “did this to themselves” and have to live with the consequences. Sometimes people may see them as pathetic. Perhaps some people wonder what drove them to drugs in the first place. Do they have an undesirable home life? Were they abused? That may be the case for some, but not all. Everyone that has an addiction came from somewhere. They have parents. They were an adorable baby and a cute kid. They had (and still do have) potential. A lot of them just took a wrong turn somewhere. I appreciate that this film humanizes the addict because it arms us with more sympathy to help as opposed to scoffing and ignoring the problem. I felt as though lighting played an important role in this film. When Nic was with David, particularly at home (but also in diner scenes) everything seemed quite dark. Despite their home being larger than average, there also seemed to be more claustrophobic spaces when Nic and David were together. I found this surprising given that their father/son relationship initially seemed strong, and it didn’t feel as though David was any sort of trigger for Nic when it came to his addiction. Outside of the home, we are met with stunning, bright, and vast landscapes with the rolling green hills, as well as the ocean. When Nic is in LA with his mother, Vicki (Amy Ryan) on the other hand, everything seems much lighter and airy. Also surprising given the relationship between Nic and Vicki was much less strong. I was also impressed by the sound mixing and score which did a great job at conveying the emotion and tone of any given scene. In the end, Beautiful Boy felt somewhat flat in terms of story arc – there was no specific climax or rise and fall. However, because it is based on a true story, I can understand why it came across that way. A lot of the scenes felt like an extended montage of the family dancing through this battle. This film left me with the question of ‘how much can we really help?’ How can we help our family or friends with addiction without being overbearing, accusatory and perhaps driving them right back to their vice? There is a scene in this film where David and Karen attend a family support group. On the wall, there is a sign referring to the ‘3 C’s’. I didn’t Cause it, I can’t Cure it, and I can’t Control it. Addiction is scientifically proven to be a chronic disease. It is beyond you and beyond the addict. When you grasp that, I feel as though it becomes just a bit easier to understand their struggle and how placing blame or trying force a change often has adverse effects.